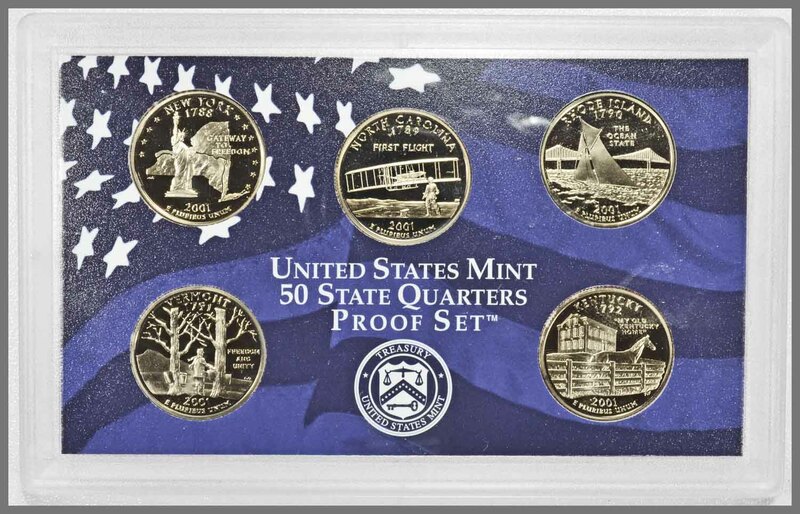 Popularity of the State Quarters and demand are the base to the 2001 US Mint proof set value. As new state quarter designs entered circulation throughout the year proof set collecting was reinforced. Three options are listed on the chart, from clad issues to silver proof coins. Note: Value Chart is an average of retail listings. Identify your set by comparing to the proof sets highlighted below. Clad proof sets are the circulating coins struck in the proof finish. The silver set is special because of the 90% silver alloy of the dime, half dollar and the five State Quarters. Ten coins are featured in the 2001 proof set. Each coin represents the circulation coinage of the year and is made of the same alloy. Lincoln Cent is copper-plated zinc, Jefferson nickel: 25% nickel 75% copper, Kennedy half, Roosevelt dime and the five quarters are copper nickel clad: 8.33% nickel 91.67% copper. Sacagawea dollar is a Manganese Brass Clad, the outer layers giving it the distinctive "golden" color. Two plastic cases house the ten coins. Cent through dollar proof coins are held with a blue-violet colored insert representing the US flag with stars. "United States Mint Proof Set" is printed in white and the US Mint Seal under. A solid color blue-purple defines the insert on the reverse. Five State Quarters are presented in the second plastic case. Reverse designs are displayed within an insert matching the cent through dollar insert. Insert displaying the obverse of the coins is a solid blue-purple color. Outer box features the upper profile of the Statue of Liberty in blue tones, a blue stripe on the top and bottom edges containing a total of 50 stars in white. Fifty State Quarter's logo and "United States Mint Proof Set 2001" complete the design. Issued as a separate offering by the mint, the State Quarters are displayed in one plastic case. An insert with a US flag depicted in shades of blue with white starts separates the five quarters. This case, both front and back, is the same as in the 10-coin set. Outer box has a Bald Eagle design, the five states listed across the bottom, State Quarters logo and "United States Mint 50 State Quarters Proof Set 2001" printed. A map of the US highlights the location of the five states on the reverse. Listing the year they became states, all set against a blue background of the American flag illustration. A third annual offering of 2001 is the silver alloy proof set. Ten coins are presented in two plastic cases. The insert graphic is the waving American flag in shades of red with white stars. 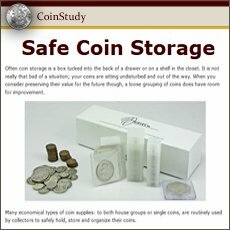 One case houses the Sacagawea dollar, Kennedy half (90% silver) Roosevelt dime (90%) silver, Jefferson nickel, Lincoln cent. Five State Quarters - all 90% silver - are within the second plastic case. Insert of the US flag graphic in red enhances the reverse of the quarters, a solid red insert displays the obverse of the quarters. A red theme denotes this set and continues to the outer box. Statue of Liberty in pale to deep red on the front of the box and a more complete version of the US flag graphic on the reverse with a large US Mint Seal in white. Seven of the coins to this set are 90% silver. As of 4/22/2019 these coins represent a total of $20.06 in silver value. Forming a solid base to the 2001 US mint proof set value. 2001 continues the issue of five state quarters each commemorating a state and the year entering the union. New York joined the Union in 1788. Growing quickly in population and importance to the country. "Gateway to Freedom" is the theme of the design, recalling the immigration of millions of people in the past and continuing to the present. An engraving of the state with topography forms the backdrop to the full view of the Statue of Liberty. Liberty is minutely engraved, highly detailed flowing gown, torch and head. Showing as a deeply engraved line through the map is the westward exploratory route between the northern Adirondacks and the southern Catskills mountains. The line traces the Hudson river valley and the Mohawk river valley. First Flight themes the North Carolina state quarter. Once part of the Thirteen Colonies and entering the Union in 1789. Growing economically and in importance, it is noted as the location of modern air flight. Filling the design is the Wright brothers "First Flight" depiction. Well engraved is the famous bi-plane. Rhode Island state quarter celebrates the entering to the Union in 1790 and ratifying the US Constitution in the same year. Although the smallest state in total area it is well positioned along the eastern coast and suitable to the shipping trade. Costal waterways, bays and inlets are important to its shoreline. Adopting the official nickname "The Ocean State" the design of the quarter also highlights the Pell Bridge in the background. Per the official mint description, a vintage sail boat is on the Narragansett Bay occupying the foreground. All elements of the design are minutely engraved. Designer Thomas D. Rogers placed his initials within the waves in the lower right corner, interestingly one the hardest of all designer initials to find. As found on the State Seal "Freedom & Unity" has been the Vermont state motto since entering statehood 1791. Setting the background to the design is the Camel's Hump Mountain part of the Green Mountains range. In the foreground are two Sugar Maple trees being tapped. Maple syrup has become a leading attraction to Vermont. Trees are tapped for their sugar rich sap in late winter and early spring, hence the coat and scarf of the figure in the design. Sharing the reverse of the Kentucky state quarter are two important symbols of the state. In the foreground is a well rendered thoroughbred racehorse. Behind the thoroughbred is the historic mansion Federal Hill. Built by Judge John Rowan over the course of 1795 to 1818 and became known as "My Old Kentucky Home" serving as a meeting place for important events shaping the course of the state. Kentucky is located in a favorable climate enhancing large pasture land suitable for livestock and farming. Horse racing was quick to take hold and is still a major attraction to the state. 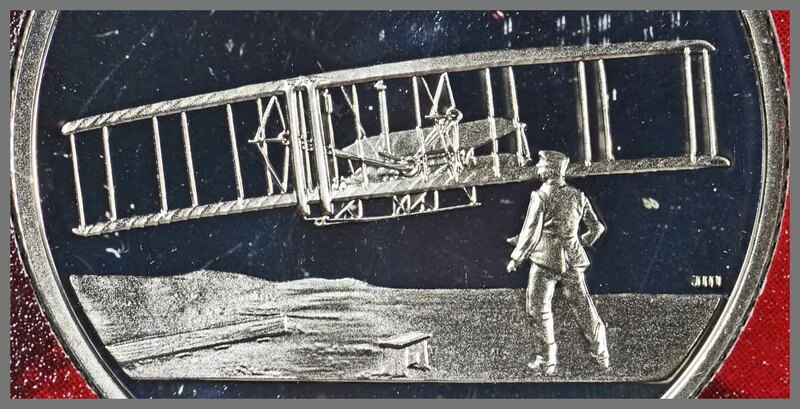 Finely detailed and engraved is a depiction of the first flight of the Wright brothers in 1903. Wilbur Wright in the foreground as Orville flew the Wright Flyer. An impressive design to the South Carolina State Quarter. Wing details, ridder and forward wings are all included in the design and recognizable. Note the rail used in takeoff and the detail of the small bench. At this point in flight, Wilbur while running along-side to steady the plane, had just released his hold. The flight continued for 103 feet before touching down. Four flights in all took place that day in December near Kill Devil Hills, North Carolina. This historic first flight is well rendered by designer T. James Ferrell on the proof North Carolina state quarter. Taking a close look due at the magnified image of the surface, qualities of the proof striking are impressive. Two striking of the die are made, special polishing of blanks prior to striking, preparation of the dies and careful handling render the design in crisp detail. No hazing of the surface has accrued due to safe storage over the years. With protection in the plastic case from abrasions, value of these US proof sets is maintained. Market forces control how much the coin is worth, proper handling is within the collectors control. Identification of your proof set is easily confirmed by the presence of the "S" mint mark. Denoting the coins are struck at the San Francisco mint, each proof coin carries the "S" mark. Circulation strikes of 2001 coins are minted at the Philadelphia and Denver mints. On the obverse of the quarters the "S" is just below "In God We Trust". On the cent and dollar find the "S" mint mark below the date. Roosevelt dime and Kennedy half: look just above the date to find the mintmark. Jefferson nickels have the mint mark just after the date along the rim. These mint mark locations hold true for both the silver and clad versions of the 2001 proof sets. Keeping the Proof Set Intact: How much the proof set is worth years from now is also considered when researching current value. Maintaining the completeness of the "set" is vital to any future value. Collectors value these proof sets today in a complete form, all cases to the set as well as the packaging as originally sold by the mint. Protect your 2001 US mint proof set value by handling all parts to the set gently. Modern proof set collecting entered with the 1955 set packaged and holding all five denominations with a protective wrapping. Value chart lists each year's separate options available as annual sets. All US coin values listed on the charts. 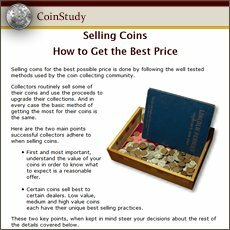 Identify your coins using the image links leading to value charts. Values are determined by: Date | Mintmark | Condition - each of these are described and imaged within each series. Surprising value is found in the smallest of detail.